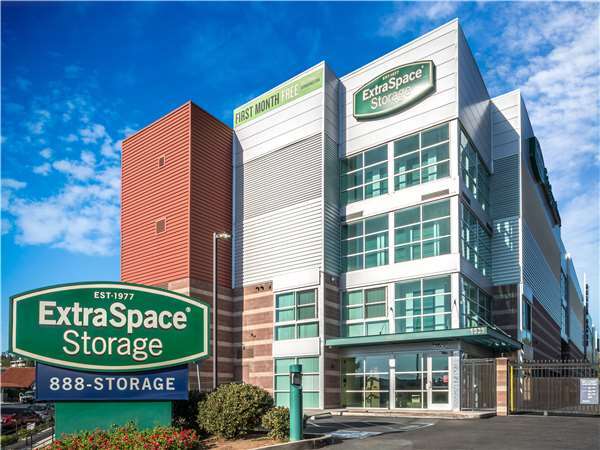 Located on E Main St just off Kumeyaay Hwy, Extra Space Storage serves residents of El Cajon, Granite Hills, Winter Gardens, and more. Locals will recognize our facility near Budget Inn, Vacationer RV Resort, and El Cajon Ford a few minutes south of McDonald's and Chevron. This place has a great facility and very friendly & informative employees! I would recommend this place to anyone, the prices, security & cleanliness of this place is wonderful! When I first got to Extra Storage I was a bit nervous. From the moment I walked in, I was greeted immediately and was shown the storage I reserved and looked at more options if needed. Tom did a terrific job me showing how secure this storage building was. I was pleased to know the precautions taken and couldn't be more thankful. Property is immaculate. Security is very good. You need code to even get on the floor your unit is on which I like. The place was supposed to be air conditioned but only the first floor where you grab a cart is cool...my floor is super hot and they said it was the coolest floor. Plus my unit is offered for a lower amount now then what I've been paying. Extra Space Storage is the best! The staff is warm and friendly, the storage is soooo clean and the price doesn't cost you an arm and a leg. If you're looking for storage, look no further... you just found the best! facility is very clean and secure. automatic lighting system as you walk down the hallways and to/in your unit. JayAnn is very professional sets you at ez as you confirm your unit. cameras everywhere so it's always being monitored. would recommend the facility to anyone looking for extra storage and the price is reasonable considering all the amenities you receive. like the elevator system, it only allows you to go to the floor that you've been assigned to. not allowing you to wonder around checking out other units. very secure. I would have to give this storage complex a 5star rating. This facility is great - clean, efficient, and I feel comfortable going there alone. It's not the least expensive place, but the quality makes it worth the extra rate. The personnel are fantastic - very friendly and helpful. Thank you! I first went with Extra Space Storage because my mother had a storage unit with them in Texas and it was great. Clean and secured and just all together good. So with that in mind I contacted the Extra Space that was close to us and reserved a unit. When we got there it was really run down and dirty and not customer friendly at all. My husband was the one that went and checked out the unit with the employee and I thought if it was too bad he would say no we are going somewhere else. So we got the unit and started slowly taking our stuff over. Granted my husband was the one who took all the stuff up tithe unit while I waited in the car with our newborn so I never saw the inside. When I finally did I was appalled! It felt like I was in a prison. It was hot, not climate controlled like I was told. The lift, yes lift not elevator was on an electric pulley system and no persons were allowed inside so you had to send your stuff up and walk up the stairs to meet it. And there were no carts so you had to walk your stuff box by box to your unit. Needless to say I immediately went looking for a new unit. This is when I found the El Cajon storage unit. It was incredibly clean and the customer service was outstanding! And the units were as cold as an ice box! I've had great service here and would recommend the location to anyone! This place is clean at all times. Parking is a little scarce and you cant always find a cart at the appropiate spots. When I am by myself I don't feel secure enough to go looking for a cart that should be at the door when I put in my code. The automatic lights do not stay on very long and that is very scary for a single woman using these facilities. I am really not happy at all with my whole experience and thinking of getting another space from somewhere else. I stopped by this facility to get prices on a big unit to store the items from my house I just lost. I moving back to the San Diego area from Huntington Beach. Richelle was very friendly...almost flirty....which I didn't mind at all! The price was a bit higher that other companies I checked in the area (2). I will be back to see Richelle, I'm staying in my house until they phycially remove me. Thanks for brightning up my day, Richelle! Take 67 South to I-8 East exit Greenfield. Turn left onto Greenfield. Turn left onto E Main St. where you will see a Sky Fuel gas station on the corner. Continue on E Main St about a 1/4 of a mile, you will pass Broadway where you will see El Cajon Ford. Extra Space Storage is just down the way on the LHS. Take 54 North to I-8 East exit Greenfield. Turn left onto Greenfield. Turn left onto E Main St. where you will see a Sky Fuel gas station on the corner. Continue on E Main St about a 1/4 of a mile, you will pass Broadway where you will see El Cajon Ford. Extra Space Storage is just down the way on the LHS. Take I-8 West exit E Main. Turn right on E Main St. where you will pass Christian Fellowship of El Cajon on the right and Ideal Manufactured homes on the left. Extra Space Storage is less then 1/4 mile on the RHS. Take I 8 East towards Yuma exit Greenfield. Turn left onto Greenfield. Turn left onto E Main St where you will see a Sky Fuel gas station on the corner. Continue on E Main St about a 1/4 of a mile, you will pass Broadway where you will see El Cajon Ford. Extra Space Storage is just down the way on the LHS.